Last time I had a look at the economic state of play in Japan I asked the rhetorical question of whether Japan was resisting the signs and claims that she is heading towards a recession. Upbeat signs from household spending and a smaller than expected revision of Q4 GDP suggested that this might be the case. 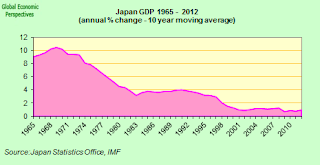 In my note however I reiterated my general discourse on Japan in which I have argued since the latter part of 2007 that Japan was now heading for a significant slowdown. The recent data from February seem to confirm my analysis. 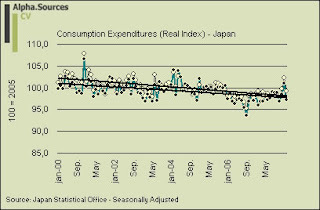 As per usual Edward has already been moving in with snippets on Japan Economy Watch regarding the latest data on inflation and unemployment, exports, and industrial production. In this note I will deal with the trend in domestic consumption, prices, and also corporate capex proxied by industry activity and industrial production. Especially this latter data point is a key gauge for the assessment of the Japanese business cycle. 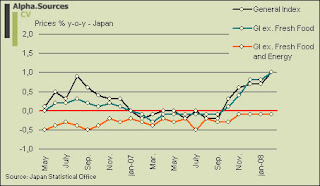 On top of the real economic data the Yen continues to linger in a territory which is likely to cause more than a few raised eyebrows amongst Japanese business leaders and the political situation is beginning to resemble more and more of battle of wills between the leading party the LPD and the opposition the DPJ. As you can see we have a lot of ground to cover and as such let us commence. If we begin with the analysis on prices the situation is basically a copy-paste from my previous analyses. The trend thus lingers with the main inflation index posting an increase in the rate of increase whereas the core-of-core index excluding food and energy is still stuck in deflation. In my last note I reiterated the general point that this divergence needs to be explained by the fact that Japan is subjected to cost-push inflation rather than demand-pull inflation. The general tendency in domestic demand relative to a buoyant external sector seems to underpin this point. For more on this I invite you to go back to my most recent note which is linked above in which I provide charts of import prices and secondary wholesale inflation. The message to extract seems to be consistent with the main inflation picture derived from the graph above. 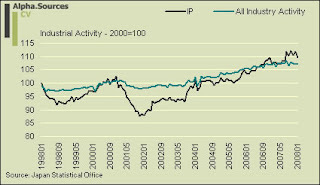 Especially energy imports have risen in price recently and this trend is confirmed by looking at the corporate price index (wholesale inflation) where the main index is flat with a rising tendency whereas energy inputs is up significantly. In general, the inelasticity between increasing inflation throughout the value chain and inflation stripped from energy (and food) underpins the current inflation dynamics observed in Japan. 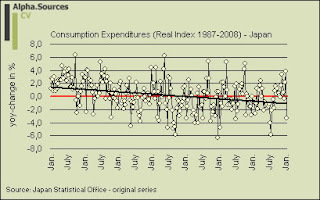 If we turn to consumer spending I noted last time how the Japan statistical office had added a couple of new time series to their arsenal. Below I field one of them which plots y-o-y increase (monthly data) in consumption expenditures adjusted by the number of workers in the household. What do these [the] numbers tell us? We’ve been noting for some time now that supermarkets have actually been doing well on the sales of food. In other words, core business has not been so bad. Sales of household products, clothing and services, however, have been dragging the overall figures down month after month. (...) Selling more food as a proportion of the whole thus seems to bring about better overall sales. We are forced to wonder if food sales are increasing due to the price increases or because supermarkets are making an effort to focus on core operations. This is all very difficult to say really but it may definitely cloud the picture. The last two graphs need little interpretation and are presented as a way to anchor the cyclical analysis by showing the monthly developments in the context of a general trend. It is thus pretty clear that the general trend for growth in consumption expenditures is inexorably down. The key I think will be the extent to which current slowdown will tilt down the trend line if at all. The uncertainties surrounding the interpretation of the consumption indicators for cyclical purposes highlight why would be well advised to look elsewhere for a solid indicator for the immediate outlook in Japan. As can be seen Japan has experienced a steady increase in industrial production since the end of 2001 which represents the trough of the last recession in Japan. Whether this line is now set to decline as part of a textbook wave-like cyclical pattern is obviously impossible to say. However, given the lengthy and messy nature of Japanese recessions in recent years and the long expansion we have up until now this figure will be interesting to follow as we move forward. Adding to the overall picture today's release of the Tankan survey (see short summary here) for large manufacturers furthermore solidifies the outlook. In numbers, the manufacturing index fell from 19 in Q4 2007 to 11 in Q1 2008 as well as the outlook measured as a forward looking sentiment gauge also declined substantially. In summary I think it is fair to say that if we look at the main cyclical indicator in the form of industrial production and corporate capex we are confirming the general market discourse at this point that Japan is headed for a significant slowdown and perhaps even a recession. 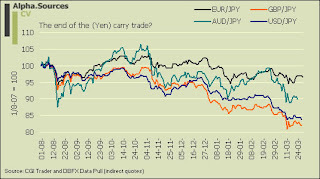 Note that down means up in this graph for the JPY as the graph shows indirect quotes. As we can see Q1 2008, which we are ending today, saw a sharp appreciation of the JPY in particular against the GBP and USD. This reflects two things. On the one hand there is definitely an interest differential story but more importantly I think is the general tendency for the JPY to be driven by the general market risk sentiment. Most recently the JPY has receded a bit but the trend is still clear. As I have said it remains to be seen what will happen if the BOJ moves in with a cut in Q2. We should expect the JPY to depreciate on such events but given the fact that the Fed and BOE may still have some cutting to do (especially the BOE) it is not clear where to put your money. I am still looking for fundamentals to reign in the JPY's rise but the time is not yet ripe to paraphrase Morgan Stanley's Stephen Jen. Moreover, I still hold that the ECB will blink during the course of 2008 (I still have Q2 pencilled in but that call is beginning to look dubious); this could potentially spell a roller coaster for the EUR/JPY since this pair is trading at relatively high levels in a more long term context. So Japan remains stranded unhappily between the one-party state it once was, under a dominant LDP, and the truly competitive democracy it might one day become. 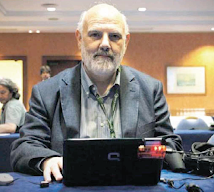 Some politicians have mused about the possibility of a political upheaval after the next election, in which the main parties would collapse under their internal strains and regroup. Yasuo Fukuda warned on Monday that Japan faced a budgetary crisis after the opposition forced the withdrawal of a petrol tax, depriving the government of Y2,600bn ($26bn) in revenue, equivalent to 1 per cent of gross domestic product. Japan’s prime minister said the expiration of the tax on Tuesday would produce a “gaping hole” in the Y83,000bn budget, forcing his administration to consider cuts to social welfare programmes or issue deficit-funding bonds. As can consequently be seen the political upheaval continues in Japan and at this point the potential for a general election is clearly there. As for concrete consequences Sato makes the timely point that consumers may well have held back on energy consumption at the end of March in expectation of the bill's expiration just as they may hoard petrol once the bill is re-instated. This is likely to happen towards the end of April. 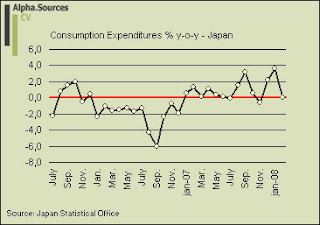 Since last time we convened to look at Japan the tide of the data has not turned much. The message from the inflation front is still one of cost-push rather than demand-pull inflation. At this point in time inflation is not finding its way to consumers in the context of durable goods and services. However, the steady increases in energy and food is another matter and here the Japanese domestic situation is beginning to resemble a situation of stagflation. In this light, the relatively upbeat trend derived from consumer spending is surprising. 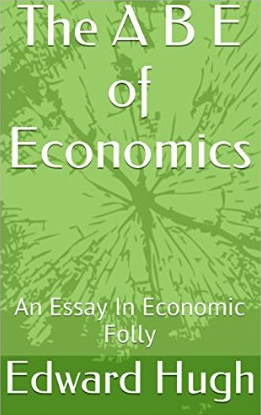 It is important to note here though that there may be a value effect in play here as the increasing value component of food and energy for which demand elasticity is low show up disproportionally in the statistics. Anecdotal evidence from a breakdown of supermarket sales underpin this. Turning to a more solid indicator for the Japanese business cycle the message derived from corporate capex in the form of the recent Tankan Survey and industrial production is quite clear. Japan is now headed for a slowdown. Exports and thus external demand may as ever be a dark horse here. Recent figures suggest that Japan continues to leverage global demand most effectively to its advantage. This could put a floor under the drop in corporate capex. In the light of the cyclical outlook above I still see the BOJ moving in with a cut in Q2 2008. In the context of the two additional themes I have included above both the JPY's recent appreciation and the political quagmire provide for several dark clouds over the Japanese economic edifice. As always when it comes to currencies the sentiment has a tendency to be rather elastic once the markets settle down. In this light the probability for unilateral intervention in the USD/JPY now seems to have abated somewhat. As for the political situation the system is currently limping. As the LDP and DPJ continue their dance macabre external investor confidence is likely to come under pressure as well as domestic confidence in politicians' ability to handle affairs is sure to wane. 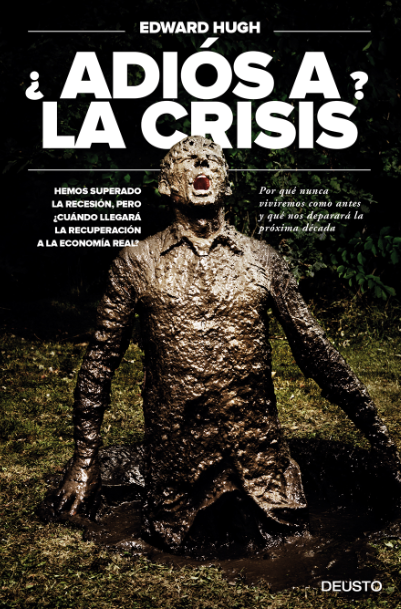 The potential hole in the coming year's budget is furthermore troubling. Japan has a distinct interest in keeping its growing public debt as a far out of the spotlight of international rating agencies as possible. The current debacle may make this difficult especially if Fukuda resorts to the knee-jerk reaction and issue bonds to cover the short fall.